Published by Red Kite in 2014. 160 pages. ISBN 978-9065592-13-4. Obtainable from Red Kite’s website www.redkitebooks.co.uk. 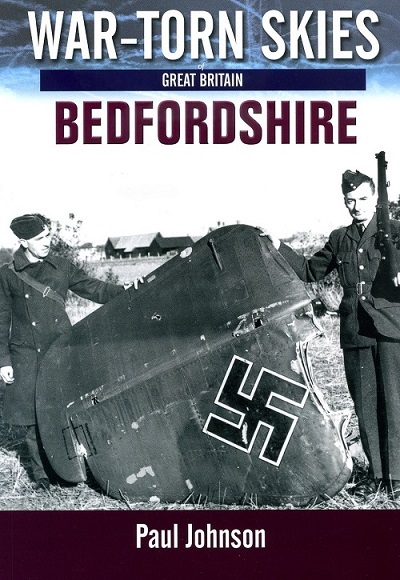 The fifth in a series of books describing the air battles and wartime activity over Britain, this volume focuses on Bedfordshire. To my knowledge, it is the only book to provide a comprehensive treatment of the county’s military aviation history (including crashes), and provides a fitting accompaniment to Graham Smith’s Hertfordshire and Bedfordshire Airfields in the Second World War (1999). The book begins with a history of Bedfordshire’s airfields, covering Cardington, Cranfield, Gransden Lodge, Henlow, Little Staughton, Luton, Milton Ernest Hall, Podington, Tempsford, Thurleigh, Twinwood Farm, and Woburn Park. Many will be familiar to readers; others less so – did you know that the private airstrip at Woburn Abbey was commandeered by the RAF, housing first Spitfires, followed by Halifaxes, Sterlings and the odd Lancaster? The majority of the book is given over to detailed accounts of crashes and aviation incidents, starting with the forced landing of a civilian Armstrong Whitworth F.K.8 near Biddenham in August 1920, followed by an account of a fatal military mid-air collision over Henlow in March 1926 and another fatal accident over Clifton in July 1928. The majority of incidents – all well-documented in detail with copious contemporary photographs – relate to wartime events, including those as a result of enemy action and air raids. A final section provides a comprehensive listing of V-1 and V-2 attacks on Bedfordshire (see below), including one as close to Bedford as Great Barford. The book concludes with a five page listing of major aviation incidents in Bedfordshire from August 1920 to July 1954, and a comprehensive list of sources and further reading. If you are interested in local aviation history or aspects of World War Two in Bedfordshire, this is a “must buy”. Strongly recommended. To whet your interest and give you an insight into the amount of detail provided by the author, I have extracted the ‘terror weapon’ attacks on the county, as these may be of general interest and are not easily accessible elsewhere. Luton – Ashcroft Road & Luton Airport. Commer plant & Biscot Road, Luton. 19 killed, 196 injured. Haynes recreation ground, 1 killed. Old Runwick Farm, Henlow, 2 injured. South of Henlow Camp. Date given as December 10 in text. By the side of the A6, Silsoe. Source: P. Johnson, War-Torn Skies Bedfordshire, pp. 156-158.